When Alfred Moss and Ken Gregory chose Tony Robinson as the chief mechanic of their new enterprise, the grandly-named British Racing Partnership, thus neatly depriving Bruce Halford of the best mechanic he ever had, neither he nor they were to know how far their relationship would develop. 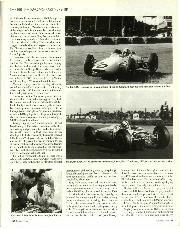 It was to become a process of discovery, from the early days of the 1958 season with just a single Formula Two Cooper-Climax to the Memorial Day weekend in 1965 at the Indianapolis Motor Speedway. In between these events came much success and, sadly, much tragedy too. The roll-call of BRP drivers was nothing less than a directory of the great and the good in motor racing; Stuart Lewis-Evans was the first and lnnes Ireland and Masten Gregory were the last. 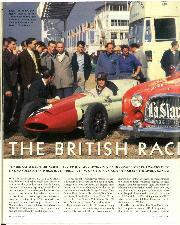 In between came Ivor Bueb, George Wicken, Chris Bristow, Hans Herrman, Harry Schell, Tony Brooks, Jack Sears, Bruce Halford, Henry Taylor, Olivier Gendebien, Dan Gurney, Cliff Allison, Phil Hill, Mike Parkes, Trevor Taylor. And Stirling Moss. 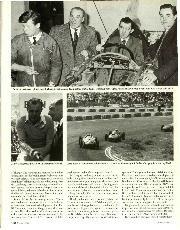 Right from the outset, the BRP was an entirely commercial exercise and Moss junior was only peripherally involved either as driver, director or shareholder; for the '58 season, he was contracted to Vanwall and Rob Walker for Formula One and Aston Martin for sportscars; there was plenty of other employment for him as well, as the only way to make a decent living was to drive more or less everything which was on offer. He would not appear for BRP until May 1959, driving the same BRM which would nearly kill Hans Herrmann later in the season at the Avusring. It had been an ambition of Sir Alfred Owen, who held the purse strings at BRM headquarters in Bourne, to have Moss in one of his cars for some time; the total redesign of a BRM P25 under Tony Rudd had proved a partial success and negotiations were opened to 'manage' a works BRM in BRP colours, so that the machine would be prepared by Robinson and Moss could sleep soundly. It was not that the works BRM mechanics were not to be trusted, far from it, it was merely that Moss needed to know the car he got into was the one he had climbed out of at the previous event. It was a form of superstition which had its roots in mild paranoia, partly as a result of the scuttlebutt which had been the talk of pit and paddock for several seasons. 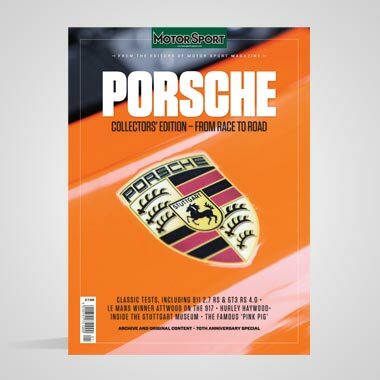 Many high-calibre drivers, like Hawthorn, Brooks and Salvadori, wouldn't deign to keep chickens in a BRM and Hawthorn had earnestly advised Archie Scott Brown, when he was tempted, "not to go near the bloody thing; it's already tripled my laundry bills". Archie didn't. Moss did, albeit on his own terms; he remembers the car as the best-handling front-engined F1 machine he drove, in fact. It was as far from the ludicrous V16 as could be, and it introduced BRP to Formula One. Tony Robinson had experience enough maintaining Stirling's Cooper-Altas and Maserati 250F, while a thorough track record on the rear-engined Cooper-Climax and Cooper-Borgwards left him well-equipped to tackle bigger machinery. So when Ken Gregory received an astonishing proposal from the three Samengo-Tumer brothers who ran the Yeoman Credit finance company, he had total confidence in Robinson's abilities and little hesitation in accepting it. 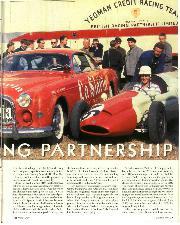 Basically, Yeoman Credit would equip an entire Formula One team for 1960, transporters and all, and BRP would manage it. It would be called the Yeoman Credit Racing team and the sponsors (a new expression in F1) would keep the trophies. The choice of cars and engines would be left to BRP. The money allowed was far higher than anyone else could field and, as a result, Ken Gregory was in a position of some financial strength. He had already engaged the incredibly quick Chris Bristow to drive the Cooper-Borgward Formula Two car (poor Ivor Bueb had died after crashing one of these in June 1959) and as number one driver for 1960, he engaged Harry Schell. 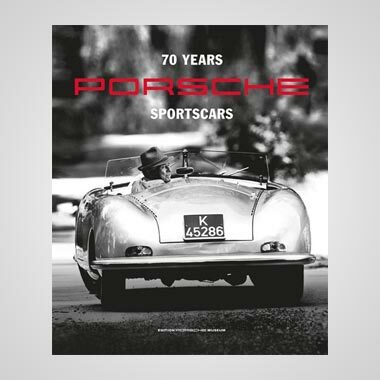 Schell was vastly experienced; he had been in at the post-war rebirth of the sport and, as a works driver at Ferrari driven in sports cars and Formula One and a stalwart of the Vanwall and BRM teams, he was a natural choice. Schell still was something of a hellraiser, but had been more than a little sobered by all the casualties there had been. The combination of Schell and Bristow should serve notice that the Yeoman Credit Team was an outfit to be watched. And so it proved. The Schell-Bristow double act was eminently watchable and a points scorer with Bristow more often than not first home. The first evidence of how ghastly 1960 would he though, came at Silverstone, where in the wet practice for the Daily Express Trophy race, Harry Schell clipped a retaining wall. The car flicked up on two wheels, Schell's helmet smacking into the corner of the wall. To the casual onlooker, the car merely looked parked when it came to rest, but Harry Schell was dead, his neck broken. The team withdrew from the event. The Samengo-Turners were upset, too, but resilient. They authorised an extra car and Tony Brooks was drafted in to replace Schell. The third car was driven at times by Jack Sears, Henry Taylor and Bruce Halford, until the Belgian Grand Prix at Spa in June, when the skilled local Olivier Gendebien, who would become a BRP regular, was hired for the first time. The race proved to be one of the worst in memory. 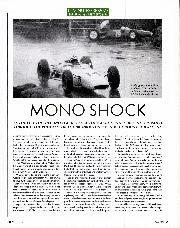 First, Stirling Moss and Mike Taylor had had crashes while practising their Lotuses. The incident that nearly killed Moss occurred when a hub sheared and a rear wheel fell off. Safety measures at Spa were so sketchy that poor Taylor was not discovered for more than half and hour. Worse, far worse, was to come. On lap 19 Bristow, not driving over his ability but dicing with Willy Mairesse, lost control and went off the road at Bumeville; he was decapitated by a low fence. Then, on lap 24 Alan Stacey, hit in the face by a rising pheasant, left the road; his Lotus rolled and burned. The brave and gentle Stacey died instantly. Three drivers in eleven months. Bueb, Schell and Bristow. Things, it seemed, could not get any worse. Mercifully, they didn't. Back in Britain, though, events were brewing which would terminally degrade relations between Gregory and the Samengo-Tumers; and while they were nothing to do with racing, they were rather serious. Gregory was faced with finding another sponsor in short order. He managed it well enough, approaching the United Dominions Trust which owned Laystall engineering. The BRP effort was renamed the UDT-Laystall Racing Team for 1961. Yet it started rather oddly. As was habit by now, Gregory went to re-order a team of cars from Charles Cooper. He had lost three drivers in Coopers, but was still certain there was no evidence of any technical failure and they were merely tragic accidents. Imagine his surprise, therefore, when there were no Coopers available. Gregory had been a Cooper client, in one form or another, for several years. The explanation proffered by an uncharacteristically shifty Charles Cooper was a bottleneck in the supply of gearboxes. What was particularly vexing was that the reconstituted Yeoman Credit operation, now under the management of Reg Parnell, strolled in and bought their cars off the shelf. Rightly or wrongly, Gregory didn't believe Charles Cooper. He was later to rationalise that he was being 'got at', to prevent him from hiring the drivers of his choice. It was clear the size of his cheque book posed a distinct threat to the other teams, who lacked sponsorship (except from oil companies) to compete with BRP when it came to hiring drivers. By the time Clark and Brabham were safely signed up, lo and behold, there were cars available. In the event, Gregory bought his entire racing equipage from Colin Chapman, making a nice little order of three Lotus 18s, three Lotus 19s and an Elite. The arrangements made with UDT-Laystall were identical to those offered by Yeoman Credit, and were to last a fixed two-year period. 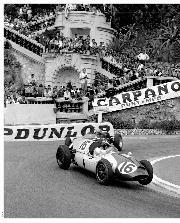 The stalwarts of the team in 1961 were Henry Taylor and Cliff Allison, reinforced by Stirling Moss, Masten Gregory and one or two others; while the team did well and made a good profit, the results were mixed. Before the '62 season wound down, BRP was to considered its options once again. They were once more without a sponsor and it was clear that the technology game was starting to overtake them. The Lotus 25 monocoque car which gave Jim Clark second place in the world championship (he would win with it in 1963) was obviously the thing to have but it was not available to anyone but the works. BRP kept their Lotus 24s, made obsolete by their creator, but Robinson was charged to build a monocoque Formula One car for BRP to enter itself. Robinson was a skilled engineer, but untried as a designer. What he came up with was very much on the pace. It has been said it was a Lotus clone, but that accusation does not bear close scrutiny. The car looked a bit like a Lotus in that it was at least cigar-shaped, but Robinson engineered it rather more substantially, using painstaking empiricism. It used Lotus 24 front uprights and Lotus wheels, but that was more or less the full extent of the resemblance: The car, BRP 1/63, was ready in time for the Belgian Grand Prix but retired due to a gear selection problem. Next time out, at Zandvoort, Innes brought it home in fourth. Heads turned. Robinson had reason to be pleased; to score points almost out of the box was exceptional. Ireland was delighted but was convinced its BRM engine was down on power against the works units. If that was the case, then Tony Robinson's achievement was higher still. If anything, given what was to happen the following year, the car was perhaps a little too successful for its team's health. The BRP proprietary effort hit the sport at a time of change. The team had no sponsor, but neither did anyone else; the backing from fuel companies was not calculated to pay more than the most quotidian of bills for anybody. It was becoming clear that escalating costs, as technology advanced and was harder to replicate, meant an organisation was needed lithe spoils were to be shared. It was called the Formula One Constructors' Associations, and it sounded the death knell of BRP. But it did so for the wrong reasons. There was no doubt in anyone's mind that if a deal was to be done to finance the development of further BRP models, then Ken Gregory was the man to do it. He had proved it twice already and, crucially, was a businessman first and foremost. As he was to say later, "I never told Tony how to build the car; he never told MC how to pay for them." But Gregory was losing interest; his relationship with Stirling Moss was not what it had been and his interests were gravitating towards aviation. It is possible he felt restricted now that Stirling was a director and shareholder and that he wanted his own business. Whatever, when the ambush came, halfway through 1964, he did not respond as he might have done before. The diktat handed clown from on high by the F1 constructors was that BRP did not qualify as a member of their organisation and could not profit from the starting monies organised between the cartel and the race organisers. The reason given, that BRP did not manufacture enough of their own components to qualify was, tv ii loin this distance, specious. Tracing the architect of this is interesting. Ferrari had grandly eschewed membership of this enterprise of upstart garagistas' from the outset; Brabham and Cooper were friendly to Robinson as an engineer and BRP as a team. 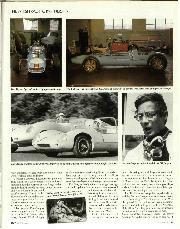 BRM, not untypically, could not have cared less, which left Lotus. Cohn Chapman remained convinced the BRP machine was little more than a knocked-off Lotus 25. It was not, of course, and never had been, but the persistent lobby to eject BRP from the sport was, to the members, apparently irresistible. Gregory and Robinson offered their cars for inspection after the 1964 Mexican Grand Prix; no one from the F1 association even bothered to come to see them. The BRP had been blackballed. By November, the press carried reports that the BRP would not compete in I965 though the decision was not made formally to withdraw until December. Ireland was incandescent. In his fine memoir, All Arms and Elbows he was to make much of the iniquity of this 'star chamber' decision saying that many constructors of the time made fewer of their own parts than did Tony Robinson and that the whole sorry episode was little short of shameful, or words to that effect. 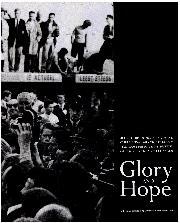 There is evidence to suggest that Ireland wanted to go even further, but Ken Gregory, who edited his memoir, was more cautious about the potential impact of a law suit on Ireland's pocket. It was to no avail; the momentum had run out. Reluctantly, the BRP made plans to wind itself up. Just after Christmas though, Masten Gregory knocked on the door again, He found himself with a new stepfather, George Bryant, who had made a fortune in the mail-order business and had married Masten's widowed mother. He had plans for a twocar Indianapolis 500 entry, to be driven by Masten and Jimmy Lloyd. Who would build the cars? 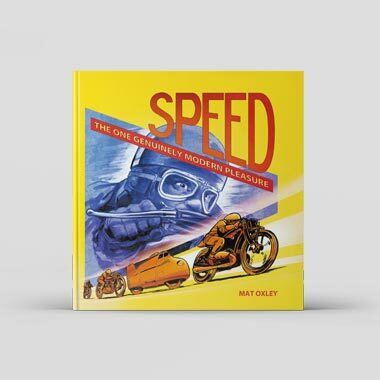 Masten Gregory, from Kansas City, Missouri, considered himself a 'European' driver, but for any driver from the USA the sure route to automobile immortality is to win at Indianapolis. It was clear that the "funny foreign cars" were in the ascendant; that had been suggested by Jack Brabham's Cooper-Climax in 1961, but the catalyst for the foreign invasion was, ironically, the decision by Ford to produce a 'customer' engine with an Indy application. It displaced 4.2 litres and produced a proper 420 bhp together with gobs of torque. It also cost a ferocious amount of money; a whopping $31,000 at its introduction. George Bryant wasn't messing about. He had hired George Salih as chief mechanic. Salih, after supervising and preparing Lee Wallard's winning Kurtis-Offenhauser in 1951, had more or less developed the Indy 'roadster' by turning the sacred Offy through 90 degrees to lower both frontal area and centre of gravity. He was in many ways an American Alf Francis. Innovation was second nature to him and he fully appreciated that the combination of a British chassis powered by a rear-mounted Ford engine might well do the job. He had no reason not to think so. There was a school of though that knew Jim Clark would have won the '63 race in the Lotus-Ford but for a liberal interpretation of the rules governing oil-spilling in favour of Pamelli Jones, and that the 1964 race could have been his also, had his suspension not been wrecked by a burst tyre. Tony Robinson, who had never even seen Indianapolis, let alone the Ford engine, resolved to over-engineer the racers in the same way that he had the 1963 F1 air. He set to work in January, 1965. By March, the cars were ready. Broadly, he followed the outline of the F1 cars he had already built; he allowed for steering offset, because Indianapolis cars only turn left, and made provision for huge tankage. Here is where the project nearly stalled. The supplier of the tanks was Imperial Metal Industries, an ICI subsidiary. It took a soft-hearted executive on the rise within ICI, one John Harvey Jones, to take pity upon the engineer and sell him the tanks at cost. As a commercial venture, the tanks cost IMI a considerable amount of money, but the BRP effort broke even. The cars arrived at Speedway, Indiana, in time to be fitted up for the qualifying period, which famously goes on for weeks. Bryant, Sahli, and Masten Gregory were well pleased with Robinson's efforts. Gregory qualified the car at over 154 mph, well within the target set by the Lotus-Ford. There were fifteen other Ford-engined cars; Clark qualified at 160 mph and won at 151 mph. Sadly, Gregory's 'Bryant Special' retired from fifth place the untested ZF gearbox broke. Slightly tongue-in-cheek, BRP offered their swansong product at £8000 a pop in the summer of 1965; there were no takers, nor were any really expected. The game was over and the works were sold lock, stock and barrel. Consider if you will, though, the magnitude of Tony Robinson's achievements; with no formal induction into the business of race design he had produced an F1 car which scored points in its second race and an Indy car which qualified at over 150 mph weeks after an entirely untried chassis met a real engine for the first time. 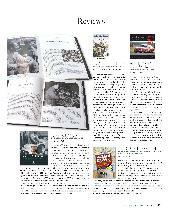 Consider also the impact of such an event on motor racing today. 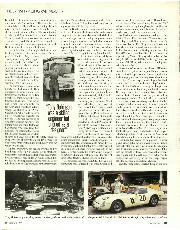 A bad year for Ken Gregory became a good one for Masten: he won at Le Mans. It was a private entry, a Ferrari 250LM belonging to the North American Racing Team. It should not have won, but it did, beating the works car. Enzo Ferrari was allegedly miffed, for it wore the wrong tyres. 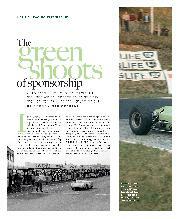 Sponsorship was beginning to drive the sport. Ken Gregory finally left motor racing to manage and build up his airline business; it was to go well until the uncertainties of the economy forced a merger, after which he turned to publishing, in which he stayed for more than 10 volatile years. Alfred Moss began, at last, to retire; he was to die from cancer in 1972. Colin Chapman, of course, went on to secure his ground-breaking deal with Players tobacco within less than three years. It was, in its execution, a much more expensive deal than the one between Gregory, Pa Moss and Yeoman Credit, but by that time Lotus had won two very costly world championships, and the inflation, which has characterised the sport ever since, was starting to take hold. Tony Robinson was snapped up by Jack Brabham and Roy Salvadori in quick succession and finally left motor racing in 1969. Today he lives in West Hampstead, North London, near his old stampingground, and still strolls past the old BRP works at Dukes Head Yard, Highgate, from time to time. He has yet to see his first Indianapolis 500 race.